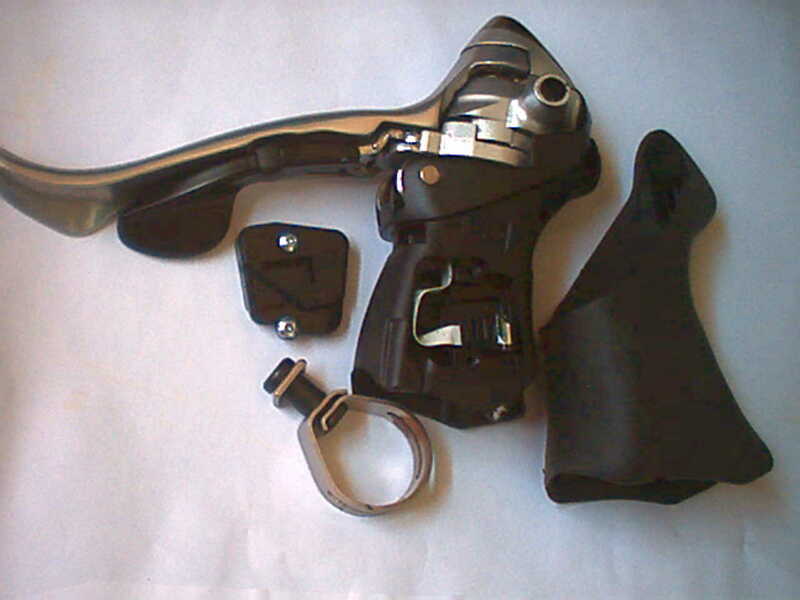 The gear shift mechanism is entirely contained within the outer brake lever. It moves with the brake lever as it pivots on the handlebar bracket. The shift mechanism is similar in operation to a SIS downtube lever combined with a spring loaded ratchet system to return the lever to the home position ready for the next gear shift. The outer lever shifts to a larger sprocket/chainring against the ratchet spring. The inner lever shifts to a smaller sprocket/chainring by releasing the ratchet mechanism, allowing it to move back one position under the control of the spring. The lever and shift mechanism are readily detached from the handlebar bracket and some cleaning and lubrication can usefully be performed without complete disassembly. A thorough service or repair requires removal of the ratchet assemble from the lever body - this releases a number of springs which will need to be retensioned and the mechanism restored to the correct position. Examine the photographs and, in particular, compare your shifter to them to be certain you can put it back together again. Click on any of the photographs to view a larger version. Your browser may resize the image to fit in the window but you can expand it for a real close look. Most large images are 1280x960 resolution. STI shifters have two levers. Referred to variously as upshift/downshift outer/inner and, by Shimano, as 'A' and 'B'. We'll call them the outer or main lever, i.e. 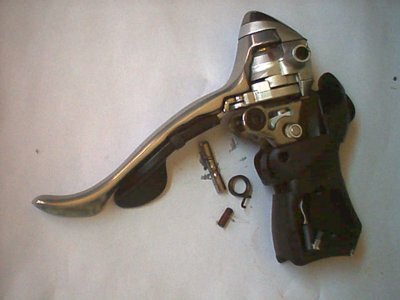 Shimano 'A' and the inner lever, i.e. Shimano 'B'. The outer lever is the long one that operates the shift mechanism. The inner lever is the short one that releases the shift mechnism. At all times take care not to damage the Flight-Deck sensor cable. It's a four-way ribbon cable and it won't take kindly to being handled roughly or repeatedly bent. If possible, shift into top gear (rear) or bottom gear (front), i.e. the position where you would remove the gear cable. This minimises the tension on the mechanism. Dismantled, and without the release mechanism, it won't shift properly anyway so resist the temptation to operate the lever until it's reassembled. All Shimano STIs are mounted to the handlebars in the same way. Remove the handlebar clamp with nut & square washer. Remove the rubber cover (hood). Remove the FlightDeck connector cover and lift the connector away from it's housing. Note how the brake/shift lever assembly is attached via the adapter plate to the handlebar bracket (the black plastic part you rest your hand on) by the brake pivot pin. Remove the grub screw that locks the brake lever pivot in place. This grub screw can be difficult to remove. Corrosion is the obvious candidate except that it only screws into the plastic of the handlebar bracket. Whatever the cause, be sure to use a good Allen key of the proper size (2mm) to avoid rounding out the socket. If it's very tight, soaking in penetrating oil for a while helps. Drive out the lever axle using a suitable drift. The axle is 5mm in diameter so you could use an old 3/16" drill. Ease the lever away from the handlebar bracket and recover the brake return spring. Carefully pull the FlightDeck cable from the bracket. Press the contact strip flat while feeding through the slot in the bracket. Remove the brake cable hook from the adapter on the rear of the lever. Note the plastic bushes on either end. Disassembly beyond this point is specific to the type and position (left / right) of the lever. Follow the links below for your lever.